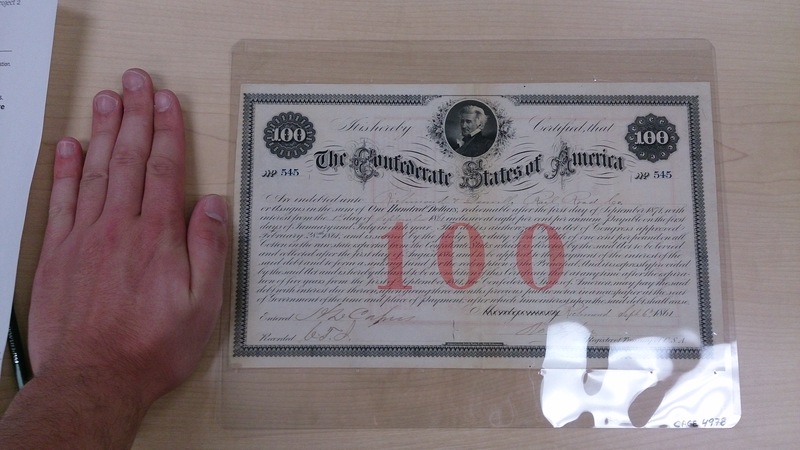 The $100 Confederate bond struck me in terms of typography. Being of such high value, the typography is very ornate. The bond says “The Confederate States of America” across the top with very ornamental capital letters. The majority of the bond is covered in very stylized cursive text describing the terms of the bond. The cursive is so italicized that it is hard to read in some points. From a distance, the text almost reads as one big shape. My hand also serves as a reference to just how big this note was. 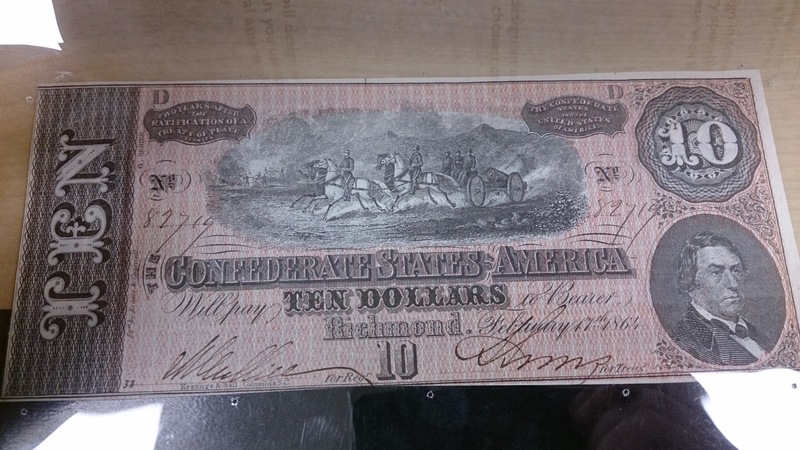 The color scheme of the D series confederate $10 note is fascinating to me. The bill uses red on one side and blue on the other, representing the colors in the Confederate flag. The front side uses primarily a red pattern of weaved lines with images in black black printed on top. The information the bill needs to display is all written in black to signify it’s importance. 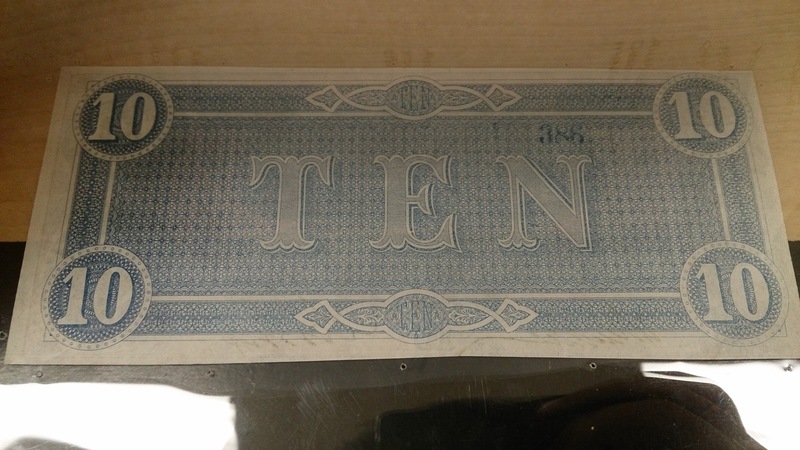 The back side of the bill only employs a blue color and much less information, only a ten is depicted in a few places. The stark contrast between the sides of the bill makes this note stand out among the rest. 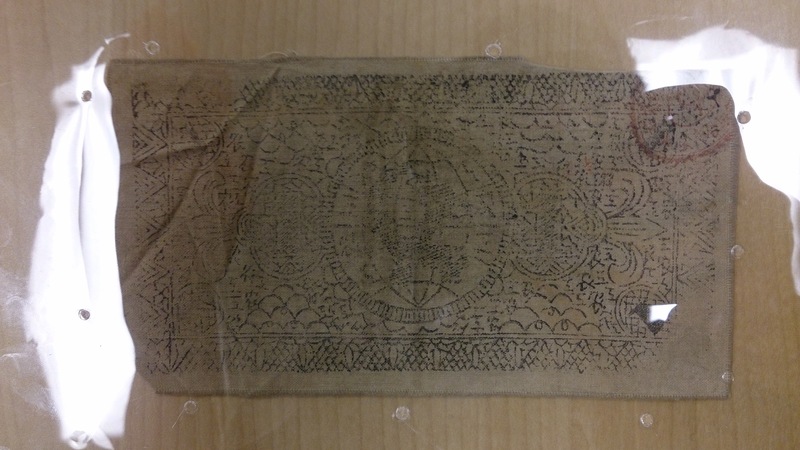 The cloth Chinese note used a very detailed pattern in a black ink that appears to have been applied with a stamp. The middle of the bill shows a circle which I think is representing the world. Emanating out of the circle are two fleur de lis patterns with circular attachments to the central circle. The rest of the note shows what could be clouds or mountains, either way describing something high up. I think the combination of mountainous imagery and very ornate patterns printed on fabric rather than paper tells me this bill was made for a very prestigious person or purpose.